Kids love to make a homemade volcano and they'll want to do it over and over again. 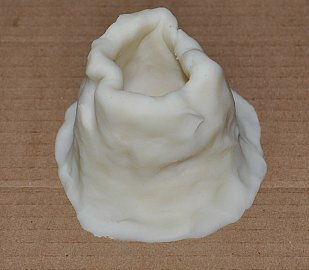 Make volcano out of clay dough and let dry overnight or bake according to the directions. You can find a recipe for playdough or clay dough. Place 2 teaspoons of baking soda in the bottom of the volcano. Predict what you think will happen before you add vinegar. Pour 2 teaspoons vinegar in the volcano. The mixture of the baking soda and vinegar forms a gas that raises up and out of the volcano. We use baking soda in cooking, such as baking cakes and cookies. 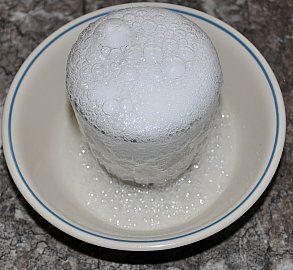 The baking soda makes baked goods rise because the bubbles burst in the heat. You don't need to make a volcano to do this experiment, it just makes it more fun. You can just use a glass placed in a bowl as your volcano. Warning: Please do this experiment outdoors because it may make a mess! Open your 2L bottle of Coke without spilling. Add the whole pack of Mentos inside the Coke. Watch as it makes a Volcano of Coke!!! Loads of fun for the whole Family. Take me back to food science experiments from how to make a homemade volcano.